New blood and bone marrow transplant procedures for Louisville kids | Norton Children's Louisville, Ky.
A new hematologist in Louisville is putting international research to practice for local kids. His specialty: blood and bone marrow disorders such as leukemia and immune deficiency. William T. Tse, M.D., Ph.D., with UofL Physicians – Pediatric Cancer and Blood Disorders, is the new director of the Norton Children’s Cancer Institute Pediatric Blood and Marrow Transplant Program. Norton Children’s Cancer Institute, affiliated with the University of Louisville, has introduced a variation on blood and marrow transplants that can translate to a lower dose of chemotherapy. The procedure, called reduced intensity conditioning transplant, can mean less pain and other side effects. Children can often have treatments in a clinic closer to home, without having to stay at the hospital for a prolonged period of time. The treatment is used to help children born with immune deficiency syndromes, such as severe combined immune deficiency (SCID) syndrome, commonly known as “bubble boy” disease. A boy with SCID treated recently at Norton Children’s Hospital just celebrated his first birthday and was doing very well. The Pediatric Blood and Marrow Transplant Program cares for children with recurrent or high-risk leukemia and solid tumors; nonmalignant immunodeficiency syndromes like SCID; and diseases such as sickle cell anemia, where the bone marrow is not producing healthy blood cells. Dr. Tse and Norton Children’s Cancer Institute have also embarked on a bold initiative to bring cutting-edge cellular immunotherapy to Louisville and Southern Indiana. With an immunotherapy treatment called CAR T (chimeric antigen receptor T cells), a child’s own immune system can be reprogrammed to kill cancer cells. The treatment received U.S. Food and Drug Administration approval in 2017 for acute lymphoblastic leukemia (ALL) in children. Dr. Tse’s goal is to offer this CAR T immunotherapy treatment at Norton Children’s Hospital within the next year. Dr. Tse also is working to bring a clinical trial to Norton Children’s Hospital using CAR T for acute myeloid leukemia and to work with CAR T as a potential treatment for solid tumors. Clinical trials can offer patients access to new treatments while they are still being tested. “For decades, the only options for cancer patients have been surgery, radiation and chemotherapy. Now there is immunotherapy. In the next five to 10 years, this will continue to get better and better,” he said. According to Dr. Tse, the cost also could come down as research advances. “We hope in the future we can use off-the-shelf, universal-donor immune cells in immunotherapy, which will help bring down the cost of this important treatment,” Dr. Tse said. Dr. Tse also is involved in research using CRISPR, a new technology that allows researchers to make precise edits to an individual’s genome. CRISPR offers the promise of editing a patient’s genes to correct mutations. Dr. Tse’s research lab at Norton Children’s Cancer Institute and University of Louisville will focus on using CRISPR gene editing technology to generate immune cells that target tumors. 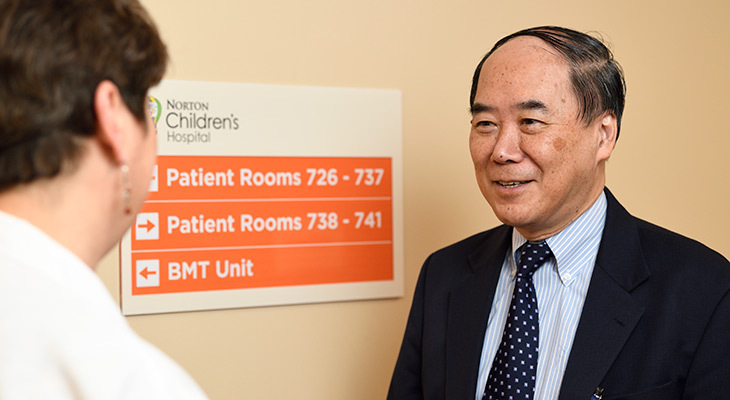 Before coming to Norton Children’s Cancer Institute, Dr. Tse was a stem cell transplant physician and researcher at the Ann & Robert H. Lurie Children’s Hospital of Chicago and Northwestern University Feinberg School of Medicine, Chicago. Originally from Hong Kong, Dr. Tse did his residency training at Lucile Packard Children’s Hospital at Stanford, Palo Alto, California, and a fellowship in pediatric hematology/oncology at Boston Children’s Hospital, Massachusetts; Dana-Farber Cancer Institute, Boston; and Harvard Medical School, Boston. Dr. Tse said he was drawn to pediatric blood and marrow transplantation when he was in medical school because it offered the possibility of curing previously fatal diseases. “We do this because it is a rewarding experience. We can make a difference,” he said.